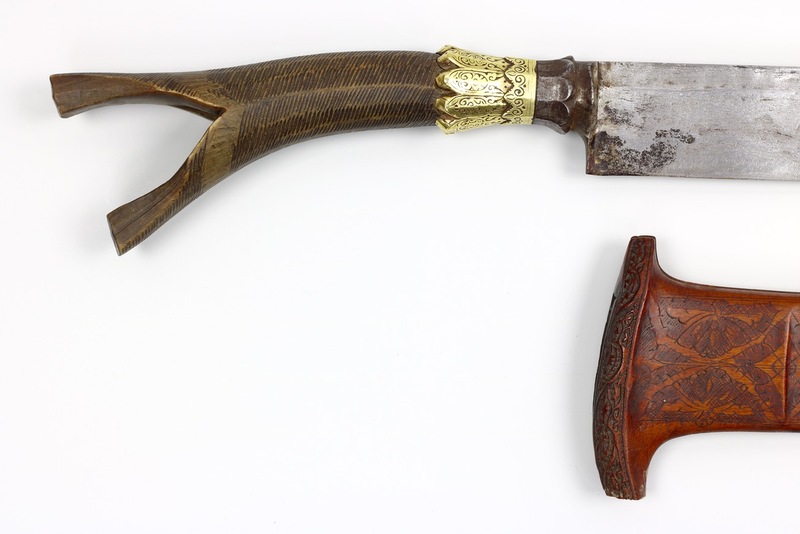 Some sikin panjang such as this example come with a golden crown, called glupa at the base of their hilts. Such glupa come with single, double and triple "crowns". Such crowns are found on another typically Acenese weapon, the rencong . We know the Sultan of Aceh had weapons with four crowns, suggesting that the number of crowns denoted rank, the more, the higher. It is said that such weapons with golden crowns were only for the panglima ranks and higher. Under the Sultan were the local lords or uleebalang who may have worn the multi crowned sikin panjang . During a state of war, such as the war with the Dutch, they appointed temporary military commanders or panglima prang . 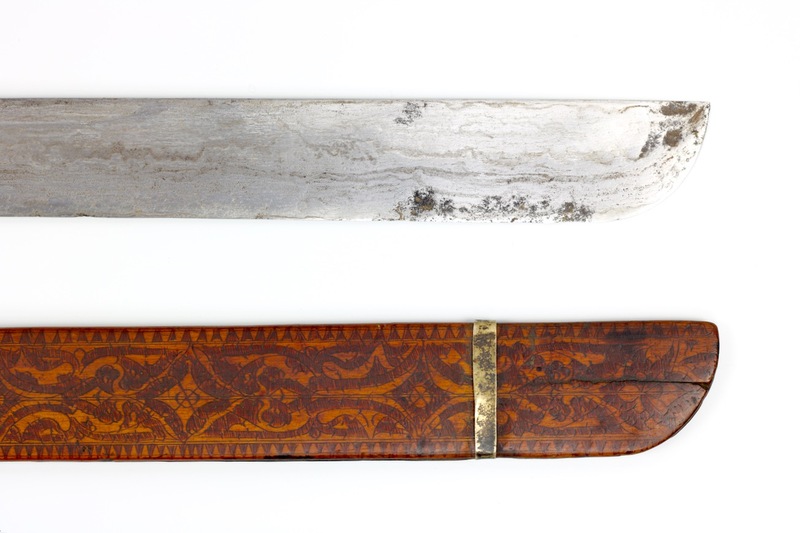 Upon appointment they received a sikin panjang and rencong (a knife with sharply curved handle), it were perhaps these panglima prang that were issued the single crown examples. Materials: Steel, horn, wood, gold. Dating: 19th century, probably before 1879. Provenance: Bought from a descendant of a former Dutch KNIL officer who brought it back from campaign. A nice example of a classic sikin panjang with golden crown. The straight blade is lightly hollow ground and with a shallow groove near the spine. The blade reveals with a nice pattern of mechanical damascus. The handle is made of horn, featuring the golden crown discussed above. 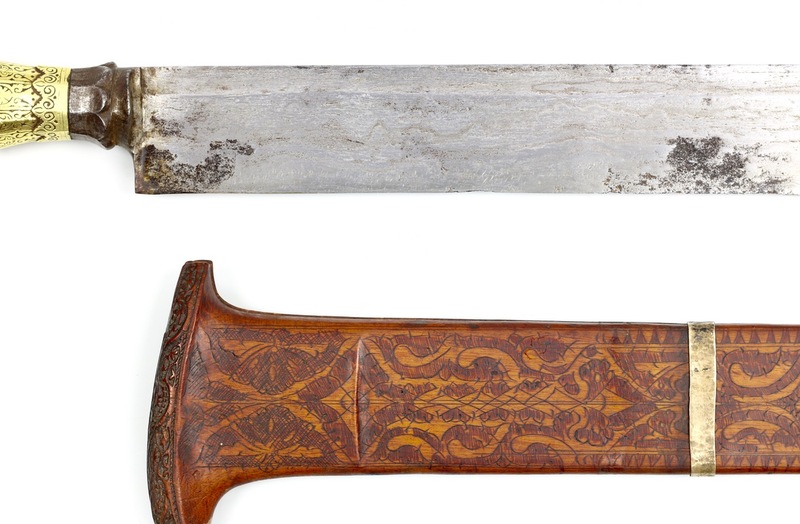 Above the crown is a steel bolster, also exhibiting the forge folded damascus patter that the blade has. 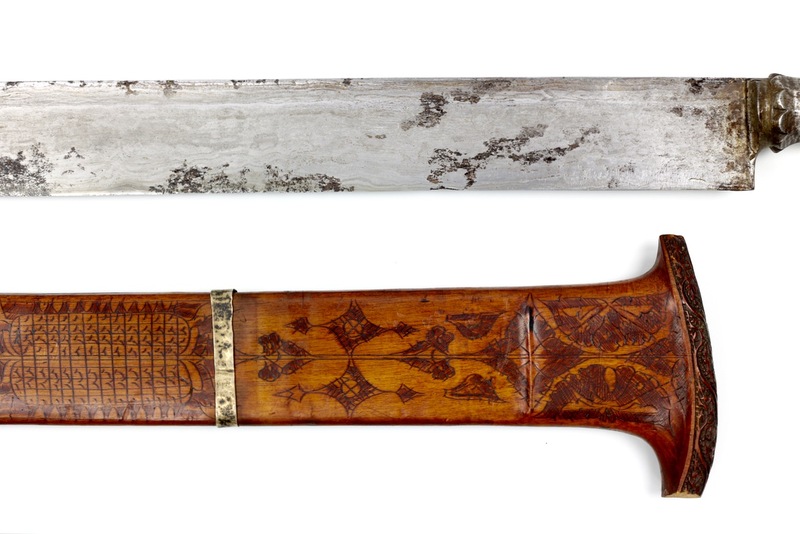 The scabbard is carved in the typical abstract floral designs. 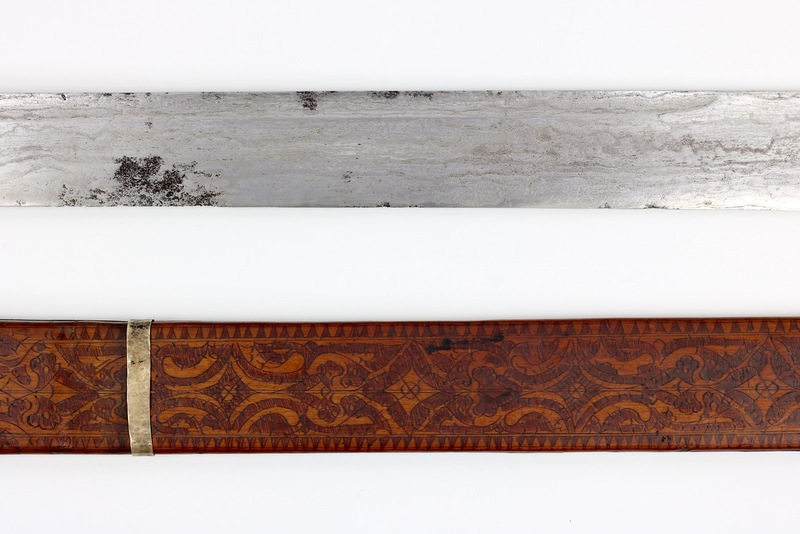 The outside of the scabbard has an interesting feature, which appears to be a simlified version of an azimat or religious talisman that was meant to protect the wearer. "The panglima prang also ranks to some extent as a member of the uleebalang's suite. Anyone who has distinguished himself on some few occasions as a warrior is raised (in just the same way as the panglima kaiuom), to the rank of panglima prang, a rather empty dignity if considered alone. The weapons (sikin panjang and reunchong) which he receives from the uleebalang on his appointment, he must return to him again if he should ever embrace the cause of an enemy of the latter. Blade is stable, but with some patches of deeper corrosion on blade. Some minor edge damage from active use. Handle in sound condition, everything is tight. Scabbard is a little small for this blade, but they came together and were probably used together for quite some time. The larger blade forced the plates to separate, which was fixed by two silver bands that now hold it together. The pointed end of the scabbard mouth is lost. A nice example of an Acehnese sikin panjang with golden crown. These weapons were worn by people of rank, starting at the local military leaders or panglima prang ranks and up. It comes complete with a period replacement scabbard with simplified "azimat" talisman design.